The most convenient and easy way to manage your money. myFinance360 – Integrate data from all of your financial accounts to create a budget, generate spending reports and more! Enter the required information and click "Submit Enrollment"
Enter the Username and click "Login." Then enter the temporary password you just created and click "Login"
Enter the temporary password you just created in the "Old Password" field. Then create a new password and confirm the new password by typing it once more in that field. Click "Submit" then "OK" to accept the password change on the pop-up message. You will now have access to your account(s). To ensure you are able to access your Online Banking account securely, please read through the browser guidelines below and upgrade your browser if necessary. Are you having trouble accessing online banking? Do you see a “Stronger Security is Required" message? Please update your browser by clicking on the link update link to the right. You should be able to access online banking after you update. Why should you update your browser? Security: The most important reason to update your browser is for your safety and security. With each updated browser, it becomes more secure against security threats such as phishing sites, viruses, trojans, spyware, adware, and other sorts of malware. To ensure your information is protected, update your browser to its latest release. Better yet, set your browser settings to automatically update when there are new releases available. Experience: Newer browsers do a better job of loading faster and better. Meaning the content will look and function properly so you have the best experience possible on the webpage. If you use an old browser, it may load considerably slower and can sometimes cause your browser to crash or freeze. To easily view if you are using an old browser, simply click on this link which will direct you to view the most up to date versions of popular browsers. *Internet Explorer Users: Version 11 is the only version supported. Check to see if you are running Version 11 by going into the settings of your browser (gear icon in the upper right corner) and clicking on "About Internet Explorer." 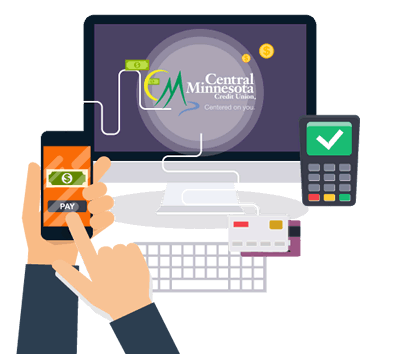 View some of the Frequently Asked Questions about the CMCU Online Banking platform. Q: I updated my Internet Banking password, will that also change my Mobile Banking password? A: No, your Internet Banking and Mobile Banking logins are separate. So, your Mobile Banking password will not be affected by your Internet Banking password change. Q: Where do I enter my password, it only asks for username? A: You enter your username first, then click Login (or Enter on your keyboard) and the next screen will ask for your password. This two-step login helps increase account security. Q: Will I always need to use a security code to log in? If so, will it be the same every time? A: For the first time you log in on a computer or device, you will need the security code. It will not be the same code each time and the security code is only valid for 30 minutes. This is known as Multi-Factor Authentication which helps keep your account more secure. It keeps track of the IP address and/or internet provider you have logged into to further increase the security on your account. If you clear the cookies on your browser or select "Do not remember this device" then you will need to use a security code to log into your account the next time.